The initial work to develop to a delta wing interceptor were initiated in Germany before the beginning of WWII by professor Alexander Lippisch, who helped develop the Me-163 , a tailless rocket interceptorl, which reached a speed of 954 km/h at 9145m. From these studies, Convair developed the XF-92A that flew for the first time in September of 1948, giving rise to the YF-102 Dagger Delta. After a fuselage redesign, it broke the sound barrier in December of 1954. The Korean War saw the rise of a new generation of Soviet jet fighters like the MiG-15. In order to keep ahead of the Russians, the French designed the Dassault Super Mystere (which 1st appeared in 1955), the Americans developed the F-100 Super Sabre and the Soviets countered with the Mig-19. Nevertheless designers aspired to an airplane capable of Mach 2, knowing that it would give them the advantage. Marcel Dassault decided to explore a concept different from the followed one by the Americans in the Starfighter F-104 and instead of using a short wing without sweepback, decided to be develop a delta wing of 60 degrees, with a great enough surface area that did not need flaps or other stabilzation. The first delta design of Dassault, the Md 550 Mirage, 1st flew on June 25 of 1955 driven by two Rolls-Royce Viper rockets of 794 kg thrust. Later it was equipped with a SEPR 66 rocket engine 1500 kg thrust, pushing it to a speed of Mach 1.3 in 1956. Combination of the regular turbojet engine and the rocket allowed an improved climb rate. Later aircraft like the Mirage II, like successor of Md 550, used two Gabizo rockets of 1500 kg thrust in addition to the the SNECMA Atar 101G of 4500 kg with afterburner. This was designated Mirage III-001, which I make its first flight in January of 1957, reaching Mach 1,8. Dassault then redesigned the wing, changing the thickness of it. The turbojet was improved to an Atar 9B of 6000 kg thrust and the rocket to the SEPR 841 of 1680 kg thrust. With these improvements, the first Mirage IIIA flew on 12 May 1958, reaching Mach 2 in horizontal flight with turbojet. Ten prototypes of the Mirage IIIA were built and used for the development of the systems of the airplane, eventually resulting in the Mirage IIIC, which first flew on October 9, 1960. A two seat trainer was also developed using the standard Mirage IIIC airframe and over 100 Mirage IIIB/C aircraft were built before moving on to the much improved IIIE and V versions. Several IIIB/C aircraft were exported to South Africa and Israel with some of those continuing on to other nations in the 'second-hand' aircraft market. 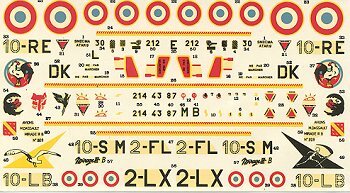 It is amazing that even after such a long time, there really is no other early Mirage III in 1/48. This particular kit from Heller has to be at least 25 years old (initial release in 1979) and probably has all sorts of fit problems. 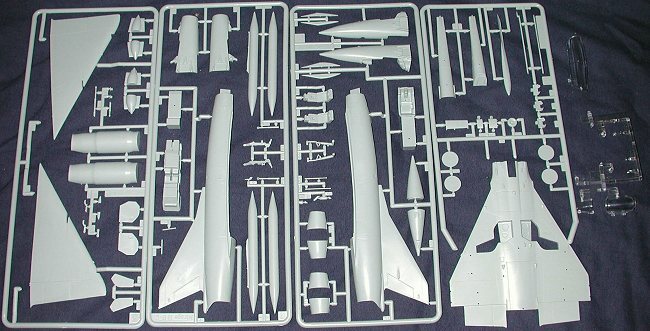 However, back when these kits were first put on the market, perfect fit was not something that most modelers really concerned themselves about. It was expected that to be able to make a really good model, we had to use some skills such as the ability to use filler and sandpaper. We also had to be able to rescribe some of the lost detail that went away during these operations. While I enjoy a good fitting kit as much as the next person, I wonder if we are headed to a time when these skills will disappear and 'shake and bake' kits are all that we can find. Well, that won't be a problem with this kit as it has been designed to be built as either a single or twin seat aircraft. This is done by supplying a new nose section that on the trainer, has a separate nose cone. This is built in on the interceptor. This means two seams that will have to be filled. The upper fuselage spine is also a separate piece. The intakes are different for the two types and those are also supplied. Considering that most of the twin-seaters were in natural metal, it will be a real challenge to build this as such. Though you might expect a lot of under wing armament, the truth is that only the thin 'supersonic' fuel tanks are supplied. Since this is a pretty old kit (literally), the decals are not in the best of shape, having yellowed over time. However, I can recall buying brand new Heller kits at this time and having them come with yellowed decals. Fortunately, there are aftermarket replacements available, though you'll have to do some looking. The kit offers a number of marking options and so let me start with the IIIC versions. First is the box art plane from EC 2/10 'Seine'. It is in French air superiority blue over aluminum. Next is one from EC 3/10 'Vexin' in the standard 'European' camouflage of dark green/medium grey over light grey or aluminum. In overall bare metal comes one from EC 1/10 'Valois'. For the IIIB versions, all are in overall aluminum. First there one from CIFAS 328, a test and evaluation unit, then one from EC 3/2 'Alsace' and another from EC 2/2 'Cote d Or'. Instructions are very typical for Heller involving the usual exploded construction steps and having it all written in French. There is a section that converts the instruction write-up into English and German. Colors are older Heller ones, though again, there is a section in English and German that translates what is what. Despite its age, it can still be made into a very nice model with a bit of work and some aftermarket accessories. Thanks to some research by Stefan Buysse, I can tell you that this is 1/48 scale and matches the much newer Eduard kit quite well. There is also the benefit that you can do a two seat version with this one should you wish. If you would like your product reviewed fairly and fairly quickly by a site that has well over 175,000 visitors a month, please contact me or see other details in the Note to Contributors.